openAFRICA is not a government portal. It is instead a grassroots initiative, that runs with support from Code for Africa, the World Bank and Google as a public service. The platform is therefore available as a free resource for ordinary citizens, civil society organisations, civic activists, the media, and government agencies. According to Code for Africa.org ...it is therefore important to tie together all the ingenuity, knowledge, and resources being created by the Code for Africa community and their counterparts in the Americas and Europe and Latin America. To that end, the Code for Africa is supporting a global effort to strengthen the CivicCommons platform, by helping evolve the project beyond its current life as a simple catalogue into a dynamic community portal. Code for Africa supports the development of citizen-driven solutions, such as the GotToVote toolkit that has already been used in Kenya, Malawi & Zimbabwe, or the actNOW and askAFRICA projects in Ghana and South Africa. The data is meant to help you change the world. "There are many areas where we can expect open data to be of value, and where examples of how it has been used already exist" (Open Knowledge International). wants you to analyse it, visualise it, share it, and build tools or services with it. 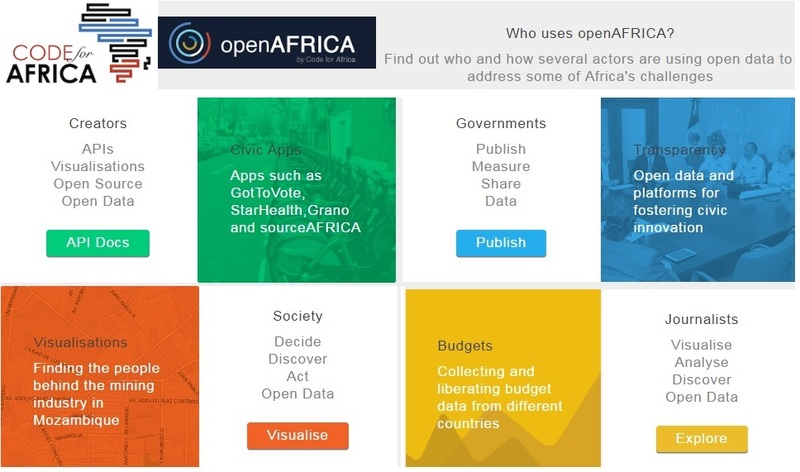 Except where otherwise noted - the data and information available through openAFRICA are available under terms described in the Open Government License. under the same permissive licence terms as above. All of the data on openAFRICA is intended to be 'actionable'. It is therefore an eclectic collection that is far from comprehensive. Much of the data on openAFRICA has been 'liberated' by pioneering organisations, volunteers or activists. It is therefore an eclectic collection that is far from comprehensive. You will, however, find datasets here that are difficult to access elsewhere. If there is crucial data that you can't find here or elsewhere, ask and the Code for Africa team might be able to help you liberate it. The Code for Africa very much welcomes and actively encourages your feedback on this site, to ensure that future iterations meet your needs. GODAN : Bringing GeoInnovation for solving Zero Hunger!